White Oak Unfinished Stair Treads - Standard Box Tread - 1" x 11 1/2" x 54"
Our stain grade White Oak stair treads are made from 100% solid FAS and Select Grade White Oak (no thin veneers or finger-joints) and shipped pre-sanded and ready for a coat of stain and polyurethane to be applied on site. All our box treads (for a "closed-type" staircase) have a full round over bullnose along the front edge and are edge-glued for stability throughout the tread's lifetime. 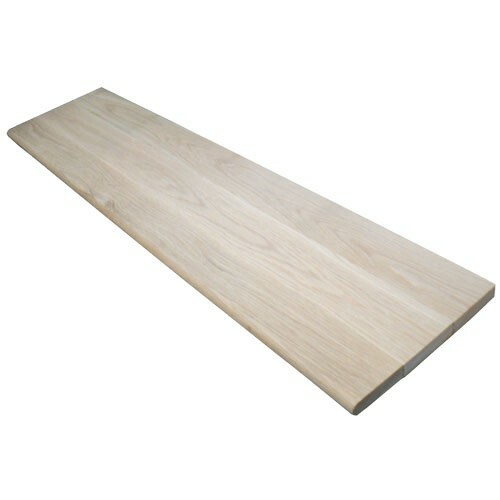 If you need a White Oak tread with a return, see left return White Oak treads or right return White Oak treads. Unfinished White Oak stair treads are sanded and ready for you to apply stain and polyurethane, we also offer prefinished White Oak treads with our UV clear-coat applied. 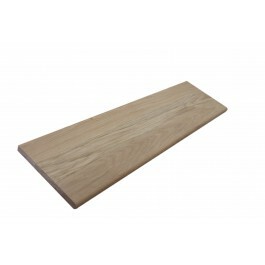 Traditional White Oak stair treads are 1" thick x 11.5" wide x 54" long. These treads are sometimes identified by their part number - 8070 White Oak Plain Stair Tread. Whether you're a homeowner looking for an economical choice in a quality White Oak tread or a contractor looking to stock up on a great buy, grab these treads while we're offing these price breaks because pricing is subject to change at any time. These White Oak treads are intended for interior use only.